When I was in the egg, I somehow came to be in Hell. I do not know how my master acquired me. It’s not important. I hatched in flames and my master baptized me in hellfire. I serve as a...messenger of sorts for Our Dark Lord of Fire who rules in Damnation, whose very name strikes terror in the hearts of mortals. I keep this terror alive by giving his orders to lesser servants and eliminating threats and enemies in ways befitting his...reputation. I see in your eyes that you understand. And now it is you who will write his message to the world. The message is this: the Dark One is coming. You will all bow to him in proper fear and deference, or you will burn. Omug is terrifying. Most frightening is his ability to appear human. He assumes this form most of the time. 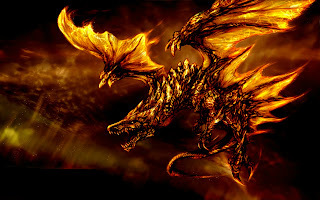 I only saw his dragon form through the aid of powerful divinations. He is a creature of ancient and terrible power. It is wise to avoid him. Before Combat Omug begins each day by casting mage armor on himself. Unless surprised, he also casts see invisibility and shield on himself. All of these are included in his statistics. During Combat Confident he cannot die, Omug begins combat with his breath weapon, followed by landing and crushing opponents. He then uses his abilities as best fits the situation. Once reduced below 250 hit points, he takes to the air again, executing strafing runs on his opponents where he alternates between using his breath weapon, and snatching opponents and dropping them from 250 ft. in the air. Morale Omug has not been given permission to die, so he flees if reduced below 100 hit points. Hellfire (Su): While half the damage dealt by Omug is fire damage, the other half is raw divine power which is not subject to fire resistance. In addition, all of his melee and ranged attacks deal +5d6 fire and +5d6 divine damage.